Mike Ribeiro found his stride in Dallas following a tumultuous start in Montreal. (Photo by Wendy Bullard). There was something familiar in the air on Tuesday evening, as the visiting Dallas Stars skated into the Bell Centre to lay a 3-0 thumping on the hometown Canadiens…and it wasn’t just the feeling of losing on home ice. With a roster boasting the likes of Michael Ryder, Stephane Robidas, and Sheldon Souray, Dallas has one of the strongest contingents of ex-Canadiens in the National Hockey League. Adding insult to injury on this particular night was the stellar performance of the Stars’ most prolific former Hab, Mike Ribeiro, whose third period tally was enough to earn him first star honours on the evening. Since the dawn of free agency, fans have been forced to stomach the idea of seeing their former heroes come to town donning opposition colours. With the exception of a few rare cases, gone are the days of the true franchise player in professional sports…and few cities have been hit harder by this trend than Montreal. With that in mind, here is just a small sample of players around the league who, for better or worse, have been traded away from Les Glorieux. 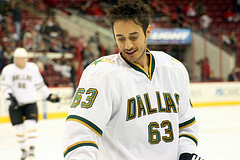 Mike Ribeiro- In September of 2006, the Canadiens traded Ribeiro to the Dallas Stars in exchange for Janne Niinimaa. Ribeiro went on to lead the Stars in scoring that season and has since developed into a genuine offensive star, consistently approaching the point-per-game plateau. Niinimaa had a cup of coffee in Montreal, skated one lap around the practice rink, and then hobbled out of town on his one good leg. In 41 games with the Canadiens, he recorded 3 assists and a -13 rating before dropping off the NHL radar and returning to Europe. Jose Theodore- In a rare straight-up, player for player trade, Montreal sent their former Vezina and Hart trophy winner to Colorado in exchange for goaltender David Aebischer in March of 2006. Theodore struggled during his time in Colorado, but has found some consistency in Florida this season following disastrous stops in Washington and Minnesota along the way. Aebischer never did settle into the role of starter in Montreal, making just 39 appearances over two seasons. The Canadiens’ saving grace in this deal came in the form of good old-fashioned dumb luck, as it set into motion the chain of events which would eventually lead to Carey Price’s ascension to the role of starter. 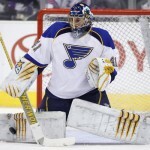 Jaroslav Halak- Following the Habs miraculous playoff run to the Eastern Conference Final in 2010, the team was faced with the mother of all goaltending controversies. On one hand, Halak had simply dominated the post-season and almost single-handedly carried the club through the playoffs. On the other, Carey Price was the prodigal son, a highly-touted homegrown superstar in the making. The following summer, GM Pierre Gauthier was forced to make the difficult decision of trading the young Slovak to St. Louis in exchange for prospects Lars Eller and Ian Schultz. While Halak has gone on to fulfill his potential and become a bona fide star, Gauthier actually got a pretty good return on his assets given the situation in which he was caught up. Eller is quickly developing into a quality NHL centre and has the size and offensive upside to become a true impact player for the Canadiens. Already having the best season of his young career at just 22 years of age, he still has yet to reach his prime. Hall Gill- Despite possessing the turning radius and acceleration of a Mack truck, Gill quickly became a fan favourite in his 2 ½ seasons in Montreal. Invaluable as a penalty killer and leader, Gill was easily the Habs most reliable defenceman during his tenure in la belle province. But with the trade deadline approaching quickly, and Gill set to become a UFA in the upcoming off-season, Gauthier was left with little choice but to make a trade, squeezing whatever value he could from his soon-to-expire asset. So he pulled the trigger on what could turn out to be his best trade as Canadiens GM; a deal that saw Gill and a conditional draft pick move to the Nashville Predators in exchange for Blake Geoffrion, Robert Slaney, and a second round pick in this year’s draft. *Given Hal Gill’s love affair with the town of Montreal, plus the fact that his wife and children have remained in the city, don’t be surprised if Gill re-signs with the Canadiens during the off-season, essentially rendering Geoffrion, Slaney, and the draft choice free pick-ups. This trade could easily become a 10/10. Ryan McDonagh- In Montreal, we don’t talk about the Ryan McDonagh trade. Ever. What are your thoughts on the best/worst Montreal Canadiens trades in recent memory? Feel free to leave your thoughts in the comment section below.